I have been passed your letters dated 23rd December 2013 and 17th September 2013 respectively which you sent to Amanda Deeks, she has asked me to respond on her behalf. I apologise for the delay in the response to your initial letter. 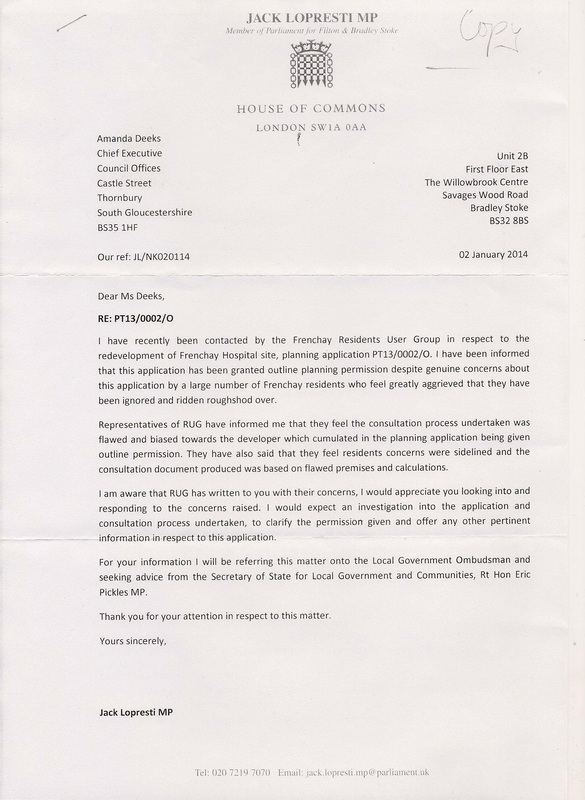 You may be aware that the council has also responded to similar concerns raised on your behalf by Jack Lopresti MP, and for consistency, where relevant my reply is coincident with that letter. In your letters you outline the concerns of the Frenchay Residents User Group in relation to the resolution of the Development Control (West) committee on 10th December 2013 to grant outline permission for the redevelopment of the Frenchay Hospital site; and the way the planning application was handled. a) That local residents feel disenfranchised as a result of the planning process. You imply that community engagement was deficient and that the views of local residents were not taken onto account. b) That in determining the decision there was little or no regard to aspects of policy D1, L5 and L10 of the South Gloucestershire Local Plan (adopted) 2006. I shall address these concerns below but I concur with you that it is regrettable that notwithstanding the efforts that South Gloucestershire Council makes to incorporate procedures to support public engagement (some of which are detailed below) that you remain so dissatisfied with the actions of the Council that you felt the need to raise them with Amanda Deeks. I think it is worth just noting the national policy advice set out in the National Planning Policy Framework (NPPF) at this stage. This reminds us that planning decisions are taken within a legislative and policy framework. It states (paragraph 11) that “Planning law requires that applications for planning permission must be determined in accordance with the development plan unless material considerations indicate otherwise.” At paragraph 14 of the NPPF Local Planning Authorities are advised in decision making to approve development proposals that accord with the development plan without delay. The NPPF makes it clear that the starting point for decision making on planning applications is the development plan policy (which itself has undergone consultation and public examination). The principle of the redevelopment of the Frenchay hospital site for residential development is supported in the Development plan policy. By way of background I attach the 76 page committee report that the Members of the Development Control (West) Committee considered during their deliberations on this application. This document sets out the range of issues considered; a summary of the consultation responses received; and an analysis of the proposal with a recommendation made. There was a further update sheet produced for the meeting for which I also attach a link. a) Whether the concerns of residents were not taken into account/and whether community engagement was deficient. i) Members of the public (including a representative of the Frenchay Residents User Group) were able to address the Members of the committee directly to outline their concerns. They spoke at the committee’s visit to the site in September 2013. They also spoke at length at the Development Control (West) meeting on 10th December 2013. Indeed, the Chair of the committee used his discretion to allow a much extended speaking time at that meeting such that the public speaking session lasted approximately an hour (as opposed to the normal 5 minutes). ii) A special meeting was held on 10th December 2013 in order to accommodate the number of objectors expected in relation to this proposal. iii) The planning report summarises the nature and number of written objections received to the application. The report then goes on to consider the issues raised in the analysis. iv) Many objectors further circulated their detailed written concerns directly to the Committee Members. The Members of the committee making this decision were therefore in no doubt of the number and nature of the objections received. Nevertheless they were also aware of the requirements of planning legislation and policy and had to balance this against taking account of all the points raised. In terms of the outline planning application the consultation requirements are set out in the Town and Country Planning (Development Management Procedure) Order 2010. This included advertisement in a local paper; site notices and letters notifying adjoining owners of land and those within 100 metres of access points. This approach is confirmed within the Council’s Statement of Community Involvement (adopted May 2008). Furthermore there is a section within the committee report (page 55) which gives further information in relation to the consultation undertaken in relation to the planning application. The consultation is in relation to the documents received as part of the planning application. In this case a material amendment was made to the Design and Access Document submitted during the lifetime of the planning application and this resulted in reconsultation taking place in relation to that document. Accordingly in relation to this outline planning application the Local Planning Authority has followed its procedure in relation to the necessary consultation. However, your letter dated 17th September 2013 refers to the applicant’s pre-application consultation and the Concept Statement. This took place prior to the outline planning application being submitted. Generally speaking (and in this case) there is no mandatory requirement for an applicant to undertake pre-application consultation with local residents. Nevertheless, many developers do so as it is a useful way to progress a design concept. In this case the applicants did produce a Concept Statement (an approach supported by the Councils Statement of Community Involvement) – which was not ultimately endorsed by the Local Planning Authority. However, this process is not a formal planning application, and is separate from the outline planning application made which was ultimately determined upon its own merits. This matter was also addressed in some detail in the committee report (pages 56-60) where the case officer considers how the proposal submitted in the planning application addresses concerns raised at the Concept Statement stage. b) Whether there was little nor no regard to policies D1, L5 and L10 of the South Gloucestershire Local Plan (adopted) 2006. The committee report and update sheet do cite and give consideration to policy D1 (design); L5) open areas within defined settlements) and L10 (historic parks and gardens) which at the time of the resolution all formed part of the adopted development plan. As I indicated earlier any given planning decision requires the decision maker to weigh up the relative planning merits of the proposal. The Development Plan should be read as a whole. Whilst I can accept that RUG feel that further weight should have been given to certain aspects of their interpretation of these policies relative to others, it does not follow that that this meant there was little or no regard to these policies in the consideration of the scheme. I hope you find this information of use. I further note your intention to refer the matter to Jack Lopresti MP (I assume this is in fact the letter the council has already received and replied to) and thereafter to the Secretary of State for Local Government and Communities. I also note your intention to seek legal advice in relation to pursuing a judicial review. I have been passed your letter dated 2 January 2014 which you sent to Amanda Deeks, she has asked me to respond on her behalf. In your letter you outline the concerns of the Frenchay Residents User Group in relation to the resolution of the Development Control (West) committee on 10th December 2013 to grant outline permission for the redevelopment of the Frenchay Hospital site. This resolution is subject to many planning conditions, and is also subject to the signing of a legal agreement (which is currently being prepared). a) That a large number of Frenchay residents feel they have been ignored and ridden roughshod over. b) The consultation process undertaken was flawed and biased towards the developer; and the consultation document produced was based on flawed premises and calculations. I shall address these concerns below but I acknowledge that it is regrettable that notwithstanding the efforts that South Gloucestershire Council makes to incorporate procedures to support public engagement (some of which are detailed below) that some residents are still so dissatisfied with the actions of the Council that they felt the need to raise them with you. By way of background I attach the 76 page committee report that the Members of the Development Control (West) Committee considered during their deliberations on this application. This document sets out the range of issues considered; a summary of the consultation responses received; and an analysis of the proposal with a recommendation made. There was a further update sheet produced for the meeting which is reflected in the minutes of that meeting (which once confirmed by the committee will be available on the Council’s web-site). a) Whether the concerns of residents were ignored. b)Whether the consultation process undertaken was flawed and biased towards the developer; and the consultation document produced was based on flawed premises and calculations. However, I suspect that in their communications with you the residents group may be making critical reference to the applicant’s pre-application consultation. This took place prior to the outline planning application being submitted. Generally speaking (and in this case) there is no mandatory requirement for an applicant to undertake pre-application consultation with local residents. Nevertheless, many developers do so as it is a useful way to progress a design concept. In this case the applicants did produce a Concept Statement (an approach supported by the Councils Statement of Community Involvement) – which was not ultimately endorsed by the Local Planning Authority. However, this process is not a formal planning application, and is separate from the outline planning application made which was ultimately determined upon its own merits. This matter was also addressed in some detail in the committee report (pages 56-60) where the case officer considers how the proposal submitted in the planning application addresses concerns raised at the Concept Statement stage. I hope you find this information pertinent, and that it clarifies the Local Planning Authority position. I further note your intention to refer the matter to the Local Government Ombudsman and the Secretary of State for Local Government and Communities. You will, hopefully, recall that I wrote to you on 17th October, as Chair of Frenchay’s Residents User Group (RUG), expressing the deep concern that the membership of RUG, now over 1100, had over the manner in which your Planning Department was handling the above application; a copy of my letter is attached. Regrettably, despite my well meant protestations, no improvement in the consultation process occurred and, finally, on 10th December this unacceptable situation was crowned when the application was accepted at a public meeting, witnessed by several hundred local residents, who judged it improperly managed. Our general conclusion is that subservience to ‘process’ has distorted the real aim of the consultation which was to engage, in an appropriate manner, with local residents, whose lives will be markedly affected by the development, and take their views into account, the large majority of whom now feel completely disenfranchised. You might wish to consider/investigate how the spirit of consultation/collaboration has been lost in your Planning Department, in stark contrast to South Gloucestershire Council’s (SGC) statements regarding community engagement. In addition to the above, there appears to have been, paradoxically, little or no regard to certain crucial aspects of SGC’s Local Plan 2006, for example, the hasty dismissal of policies D1, L5 and L10 which, together, with a number of other serious issues, collectively, suggest a positive discriminatory approach to the application has occurred. Sadly, the above situation has forced RUG to seek the advice of Frenchay’s MP, Jack Lopresti, who will be referring the matter to the Secretary of State for Communities and Local Government, Eric Pickles. Furthermore, we are also taking legal advice with a view to pursuing a Judicial Review. We are very sorry that the residents of Frenchay feel compelled to take the above actions but such is their indignation at the way they have been treated.